I remember, as a child, shopping for school clothes with my mother being incredibly frustrating. I wanted the black bomber jacket that all the cool kids were wearing but somehow I ended up with a puffy wine coloured look-alike. True, they were both hoodless, waist-length jackets but there’s no fooling a group of 12-year olds that you aren’t in fact wearing a knock-off. It’s sad but true that the impact fashion plays in social rank is starting younger and younger. 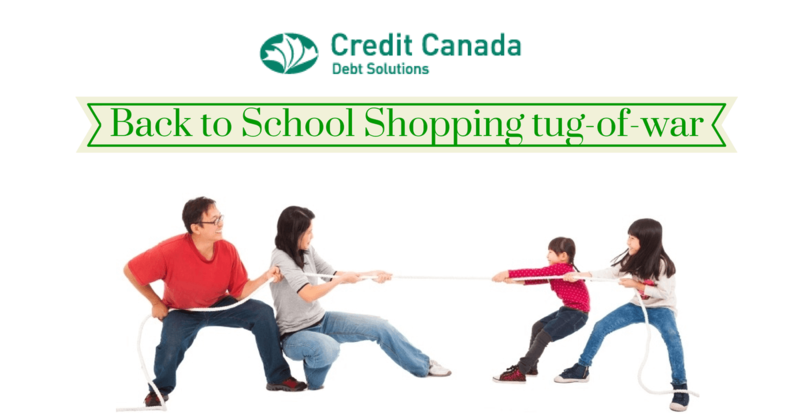 The desire for school-aged kids to fit in amongst their peers can be a challenge for parents shopping on a budget or trying to stay on course with a debt management program; a real tug-of-war between the coolness factor and mom or dad’s bank account. How to handle these shopping trips depends on the age and maturity of your child. Some kids may respond better than others to certain strategies so keep it in mind that no one knows your child better than you do when deciding what works best for sticky situations like back to school shopping. Generally speaking, I’d suggest making all the decisions yourself for your little ones but once kids get to a certain age it’s good to have them involved in decisions too when it comes to their own wardrobe. This does not mean they get whatever they want! Rather, consider compromising with them about certain items and use the opportunity to talk about what budgeting means and why it is important. Explain why a debt management program saves for future expenses. Maybe you give them a choice of 3 pairs of sneakers in your price range. This way they still have some say in the final choice without going overboard and choosing the only pair that costs more than your mortgage payment! When hitting the stores in preparation for September school bells, another important point is to make a comprehensive shopping list (and to stick to it)! Last year, my uncle ventured out with my junior-high aged cousin with the sole purpose of buying her a back-pack. “This one’s too small, I don’t like this colour, this one will probably fall apart by Hallowe’en…” After sifting through all the options unsuccessfully, they got side-tracked and somehow ended up in the fishing department. They headed home with two beautiful fishing rods but not one back-pack in hand. Mission back-pack: failed. The moral of the story here is to focus on what you went to the store in search of. If you're already in debt then contact Credit Canada to get on a professional debt management program before you even start planning on how to spend for back-to-school. Glow in the dark underwear not on the list? Put it down! You may in fact need two back-to-school shopping lists; a pre and post first day of school list. Sure, there are the basics like shoes, bag and lunchbox but you may want to wait until after class has begun to have a better idea of what stationery is provided by the school and what needs to be furnished by the students themselves (eg. pencils, pens, notebooks, duotangs). When I was in school these were all provided by the school board at the primary level but times they are a changin'; chances are you’ll be letting your little one chose between the Sponge Bob Square Pants pencils or the One Direction ones. So to all you nervous back to school shoppers just remember to stick to the list and be prepared to compromise a little. Good luck!